The Hotel Cayo Levisa has a paradisiacal location, at the north of the Pinar del Río province as a part of the Colorado Archipelago. 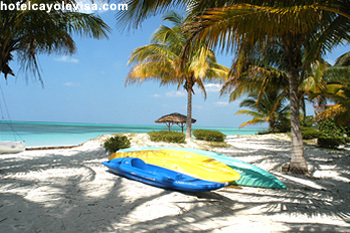 It is located in Cayo Levisa of which takes their name, this it belongs to the Palm municipality and is about two hours from Havana City. Hotel Cayo Levisa the only construction in Cayo Levisa, was inaugurated in 1992 and it is located in the north coast of key, toward the central part in the area of their smallest width. Here the sand and the vegetation mix with the crystalline and clean waters, a true paradise formed by the even virgin surroundings, and a calm beach of blue sea and white sands. 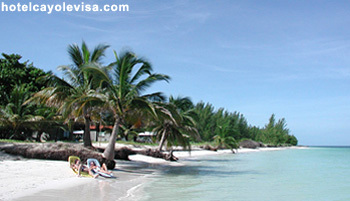 Three kilometers of excellent beaches and 23 diving sites for scuba diving make of the Hotel Cayo Levisa an excellent location for the lovers of the underwater exploration, thank to the transparency of their waters and the existence of one of the biggest coralline barriers in the world. The Hotel Cayo Levisa with its comfortable cabins, coconut trees and beaches of white sands, keeps a natural treasure in its seas, near also to Cayo Mégano de Casigua, formerly the Ernest Hemingway (American writer's) habitual refuge who baptized him with the name of Cayo Paraiso. 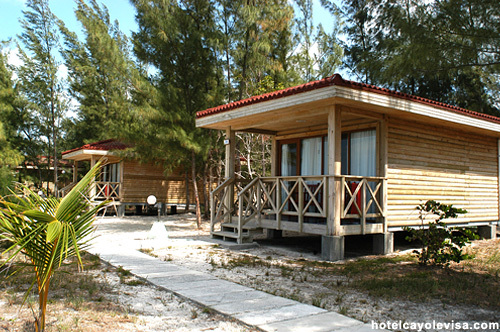 The Hotel Cayo Levisa offers them a virgin place to discover the true beauty of the keys of Cuba, in a natural atmosphere you give polluted, totally relaxant, far from the conventional tourism and of the multitudes where the privacy prevails. 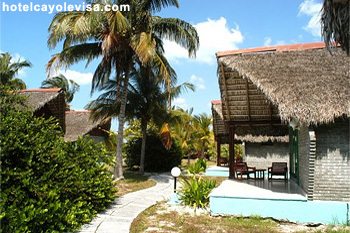 Welcome to my site dedicated to the Hotel Cayo Levisa. I am "poco a poco" researching and updating it with the aim to provide as complete as possible record of the hotel's ancient and recent history; bearing in mind that the goings-on today may one day be of historical interest.